'This volume provides for the first time a detailed overview of the Iranian languages that is up-to-date in its coverage and accessible to a wide range of readers, whether their interests are primarily in language structure, in history of language - in its own right or in conjunction with non-linguistic historical events - or in the processes and results of language contact. Iranian languages are spoken from central Turkey in the west to westernmost China in the east, and include the national languages Persian (with its national varieties Dari in Afghanistan and Tajik in Tajikistan) and Pashto (in Afghanistan), other widely spoken languages such as Kurdish (mainly Iraq, Iran, and Turkey) and Balochi (mainly Pakistan), as well as languages on the verge of extinction (such as Parachi, with about 3500 speakers in northeastern Afghanistan). In the historical dimension, they span three millennia, from Avestan (the language of the holy scriptures of Zoroastrianism) and Old Persian (the language of Darius the Great) through important medieval languages like Sogdian to the present day. The volume includes detailed descriptions of modern languages from each of the four major divisions of the family (Northwestern, Southwestern, Northeastern, and Southeastern). Unlike most earlier literature aimed primarily at specialists, this volume presents material in a widely accessible manner. And unlike much earlier literature which concentrates on phonology and morphology, the present volume, while doing full justice to these areas, also provides for the first time extensive comparative information on syntax. The syntax of the Iranian languages presents much that will be of interest to typologists and formal grammarians, with pride of place surely going to ergativity - the astonishing variations found on ergativity in Iranian languages is a goldmine for the comparative syntactician. But other phenomena will appeal equally, for instance the transformation of tense-aspect-mood systems across the Iranian languages, or the appearance of vigesimal (20-based) numeral systems. 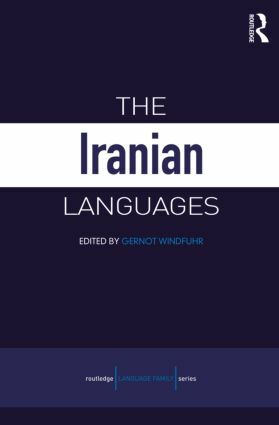 The volume also provides extensive information on the historical and areal contexts in which the various Iranian languages have lived. Discussion of language contact of course includes loanwords, but also documents the shifts in structural patterns that have occurred as Iranian languages have come into contact with other languages, including languages with structures as different from Iranian as the Turkic languages. Each volume in this series contains an in-depth account of the members of some of the world's most important language families. Written by experts in each language, these accessible accounts provide detailed linguistic analysis and description. The contents are carefully structured to cover the natural system of classification: phonology, morphology, syntax, lexis, semantics, dialectology, and sociolinguistics. Every volume contains extensive bibliographies for each language, a detailed index and tables, and maps and examples from the languages to demonstrate the linguistic features being described. The consistent format allows comparative study, not only between the languages in each volume, but also across all the volumes in the series.